A watershed is defined as an area of land drained by a river, as well as all its tributaries; all flowing to the same point called "outlet". Each drop of water falling into the watershed area will reach the same outlet at the end of its course. Its limits are natural and undefined by human activities (ridges of mountains and landscape). It can straddle different provinces, RCMs or municipalities. A watershed is mainly fed by precipitation (snow and rain). Figure 1: Schematic of a watershed. WHO’S IN CHARGE OF WATERSHEDS? There are 40 watershed organizations (OBV) in Quebec, each of which carries out a PDE (Water Master Plan) within their management zone. Since the fall of 2002, Quebec has committed to promoting integrated watershed management as a priority in its national policy. To this end, the Québec Ministry of Sustainable Development, Environment and Climate Change (MDDELCC) created 40 watershed organizations in 2009 that help protect water resources throughout the South portion of the Province of Québec. Each watershed organization develops a Water Master Plan (PDE), consisting of a portrait and a diagnosis, issues and concerns regarding water use and conservation and an action plan to be developed in order to respond to water-related problems on the territory. 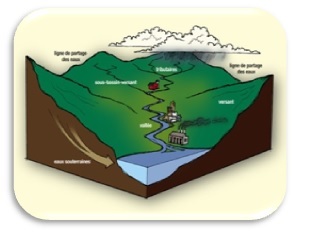 This is particularly the case of the Seven Watershed Agency called l’Agence de bassin versant des sept (ABV des 7), which since 2009 has sought to improve water quality at the level of the watersheds of seven rivers: Blanche, Coulonge, Dumoine , Gatineau, Noire, Quyon and part of the Outaouais. This body represents all actors linked to the aquatic environment, to the water resource and whose activities influence its quality. This includes the municipal, industrial, citizen, community or government sector. When implementing the PDE, government and watershed organizations seek to raise awareness and empower industries, as well as citizens, to respect and protect the aquatic environment. Because of its structure and its environmental importance, the watershed constitutes an important water resource unit that we seek to preserve. AND HOW DO WATERSHEDS WORK? As with climate and geology, human interventions have important consequences for the watershed. Indeed, all the products used, or changes in landscapes generated by agriculture, construction and urbanization make changes in the watershed area. The watershed performs essential functions in the environment. First, it collects and stores water (especially in lakes), making it an important reservoir. In addition, it allows the circulation of water beneath the surface of the soil, which will flow and join other rivers. It is mostly a rich and ideal habitat for a large number of species of fauna and flora. The watershed area is also used for humans who have exploited it to establish themselves and create jobs, particularly in the field of water exploitation, hydroelectricity production and the manufacture of paper. A watershed corresponds to thousands of interactions between fauna, flora and human beings. Due to its characteristics, a watershed allows for numerous and close exchanges between its components; be it wildlife, flora or humans. Any change in the territory may involve a change in the flow of water, or a transfer of certain pollutants into the different compartments of the water cycle. A watershed contains a large number of ecosystems, including aquatic ecosystems. An ecosystem consists of all living organisms, environmental, physical and chemical factors and interactions that bind them together. This implies the presence of a large number of very diverse living species. They maintain close links between themselves and with the environment in which they live: current, oxygenation, temperature, chemical composition of water and bottoms ..
Pollution in a river or lake = the entire watershed area may suffer. As the saying goes, "Small streams make big rivers". In a watershed, the different rivers are linked together, like a spider's web. Indeed, each watercourse flows or feeds another one downstream, this one feeds another, and so on. As a result, at the slightest disturbance upstream of the basin, the consequences spread to all downstream waterways. This is especially the case with pollution. If, for example, a pollutant is discharged into a lake, it spreads to connected streams, rivers and can reach the ocean (depending on the degree of pollution). Populations that exploit the water resource for personal consumption have to treat it upstream for pollution; traces of pollutants may be present in the organism of certain animals or plants which may be transmitted to individuals who consume them. These disturbances can therefore jeopardize the entire food chain, both for aquatic life and for the health of humans. Recreational activities (swimming, water activities) may also suffer. A watershed is a key element in the survival of ecosystems. It is fragile and its preservation has become a compulsory preoccupation in the world today. To that end, citizens, industry and government have a duty to act in order to protect the wealth it contains, as much as possible.